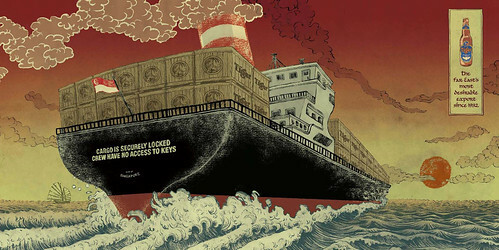 Thursday’s ad is yet another one for Tiger Beer, from a nautical series of beautiful illustrations. This ship has “Cargo Is Securely Locked, Crew Have No Access To Keys” painted on the back of the ship. Damn, and I wanted to open one. Today’s infographic is entitled Happy Beer Day Iceland and although Beer Day in Iceland is actually March 1, today in 2006, the first microbrewery there opened. Created by Weemss, it’s mostly a history of beer, and (humorously) they misspelled Guinness. Today’s infographic uses a simple graphic technique for Visualizing Alcohol Use, showing a variety of metrics using the same dot matrix.